For highly modified GM Ecotec engines built for high performance race applications, Jesel has developed an overhead cam follower designed to greatly increase reliability over the stamped steel OEM followers. The Jesel follower is easily capable of handling the added stresses resulting from the increase of cylinder pressure seen in turbo-charged or nitrous applications. These heat-treated CNC machined steel followers feature a .480” diameter needle bearing valve tip roller to reduce valve tip scuffing and wear. To keep proper valve tip to follower alignment, the valve tip is shrouded in a .240” wide pocket which guides the follower and prevents disengagement from the valve. The valve tip nose roller is nested into a patented .700” diameter needle bearing camshaft roller which further frees up horsepower. Along with the reduced friction and added strength, another feature unique to our cam followers is what we call our Tail-Hook pivot ball receiver. The Tail-Hook design features a special contoured pocket to keep the follower from losing contact and disengaging with the pivot ball at high RPM. Jesel’s OHC follower for the Ecotec engine is available for an OEM style lash post or Jesel’s Adjustable Solid Lash Post. Whether your Ford Modular V8 is being built for the drag strip, road racing or a high modified street engine, Jesel has a follower built to take the punishment. Jesel’s OHC Follower is engineered to take the abuse of opening an exhaust valve into the brutal cylinder pressure of a turbo charged application and at the same time the constant RPM changes and shifting of a 24 hour SCCA road race engine. Each follower is CNC machined in-house and heat-treated to withstand the unforeseen abuses of today’s racing engines. A .520” diameter needle bearing nose roller insures free movement on the valve tip while alignment is achieved by shrouding the valve tip with the follower body. Polished and heat-treated camshaft roller diameters of .900” for the 2V and 4V followers and .700” for the 3V insure smooth and reliable transfer of motion from the cam lobe. Along with the reduced friction and added strength, another feature unique to our cam followers is what we call our Tail-Hook pivot ball receiver. The Tail-Hook design features a special contoured pocket to keep the follower from loosing contact and disengaging with the pivot ball at high RPM. Jesel’s OHC follower for the Ford Modular engines is available for an OEM style hydraulic lash post or Jesel’s Adjustable Solid Lash Post. 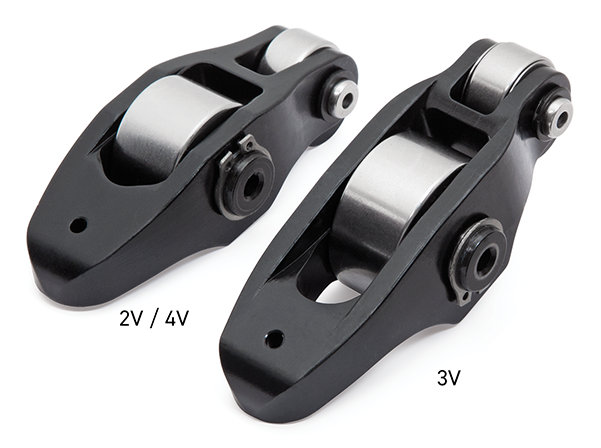 Engineered for increased strength, reduced friction and improved reliability, Jesel’s OHC follower for the Esslinger SVO/ARCA and XT head will help to insure you cross the finish line first. Whether you’re racing midgets, mini-stocks or running off-road, the design and development put forth in our followers have proven through many engine builds to provide a smoother, higher revving valvetrain. Each heat-treated CNC body is fitted with a .520” needle bearing nose roller to eliminate valve tip scuffing along with a .900” diameter needle bearing cam roller to gently transfer cam lobe lift into valve lift. Along with the reduced friction and added strength, another feature unique to our cam followers is what we call our Tail-Hook pivot ball receiver. The Tail-Hook design features a special contoured pocket to keep the follower from loosing contact and disengaging with the pivot ball at high RPM. This tail hook design eliminates the need for the typical mouse trap spring used to keep the stock follower from disengaging. These followers must be used in conjunction with our adjustable lash post which features a 5/8-24 x hex nut with a 1.125” diameter flange to easily and securely set valve lash. Jesel has designed these adjustable solid lash posts to work in conjunction with our overhead cam followers. Ford and GM heat-treated, precision machined posts are supplied with an assortment of shims to adjust for proper valve lash. The tip of this post is designed to stay engaged into the body of the cam follower. This lash post is available with extended tips for small base circle cams. Esslinger posts feature a 5/8-24 x hex nut with a 1.125” diameter flange to easily and securely set valve lash.